ITANAGAR, Dec 17: Director General of Police (in-charge) Sunil Garg commended six police personnel appointed under the sports quota for bringing laurels to the police department in particular and the state as a whole by winning medals in the recently held Commonwealth Karate Championship, the first Northeast Olympic Games, and the 6th Northeast India Karate Championship. The medal winners, Inspector P Nobin Jomoh and Constables Pisa Nachung, Kaling Palon, Mui Ama and Janam Dodum, led by Team India coach for the recently held 9th Commonwealth Karate Championship in South Africa, Inspector Bulang Marik, on Monday called on the DGP at the police headquarters here. While Jomoh won two silver medals in the 9th Commonwealth Karate Championship in Durban, South Africa, constables Pisa Nachung, Kaling Palon, Mui Ama bagged a bronze medal each in the 6th Northeast India Karate Championship in Dimapur (Nagaland). Constable Janam Dodum bagged a gold medal in the first Northeast India Olympic Games held in Imphal (Manipur), and a bronze in the 6th Northeast Karate Championship. 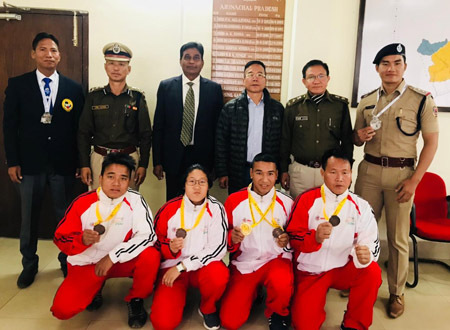 Congratulating the medal winners and the India coach, the DGP, who is also the president of the Arunachal Pradesh Police Sports Control Board, called for recommending their names for commendation certificates. He also asked them to bring more laurels to the state and the country by winning more medals in future events. Top police officers of the state, DIGP (HQ) Kime Kaming, DIGP [Crime & Intelligence) Take Ringu, and AIGP Kime Aya were also present.